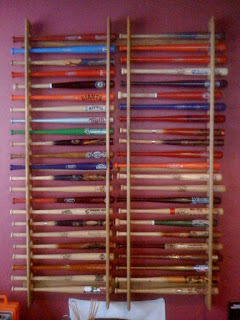 Last year for Christmas our Grandpa Kjos made Mik mini bat racks for his collection. Dad finally got it up in Mik's room and filled it with the mini bats from the trip. It looks really cool, although the photo is just from Dad's phone. The place I host most of the photos for this blog had a crash that seems to have affected most of the images on the blog. I do not currently have them on my computer and only on my external harddrive and some also on CDs because they were taking too much space on my laptop. I will try to slowly get the posts to have photos again. There are hundreds of posts and I think all, but some of the pre trip posts were affected, so it may take a while. Update 3/7/10 - I finally got the photos all back in the posts.